Since Grandma didn’t write anything a hundred years ago today, I thought that you might enjoy this 1914 advertisement for Swans Down Cake flour. Posted on October 13, 2014 October 9, 2014 by SherylPosted in AdvertisementsTagged 1914. That brand must not have been popular in our area…..I’ve heard of it, but my Mom never used it. It’s still sold in the supermarket where I shop. Back then ladies were a bit ashamed to make anything other than from scratch. I love these vintage ads you find for us. I’m glad you like the ads. Sometimes I think that it’s a little sad that today many people seem to prefer commercially-prepared foods over home-cooked foods. I have a box of Swans Down in my kitchen. It makes a lovely cake but the name, if I think about it, is not all that appetizing! Love all these old advertisements. It’s nice to hear that you like the ads. I also enjoy them. Oh yes. Swans Down Cake Flour! And one always had to sift the flour before using it. I wonder if the purchaser planned to use it to sift flour — some arty thing — or just to add to an antique collection. Mine is gone too, but I don’t know which of my moves did it in. I remember Swans Down Cake Flour. OHH makes me old…ha ha. I always have a box of Swans Down cake flour in my pantry. I generally just use all-purpose flour when I make cakes–but I always think that they would be lighter and fluffier if I had used cake flour. 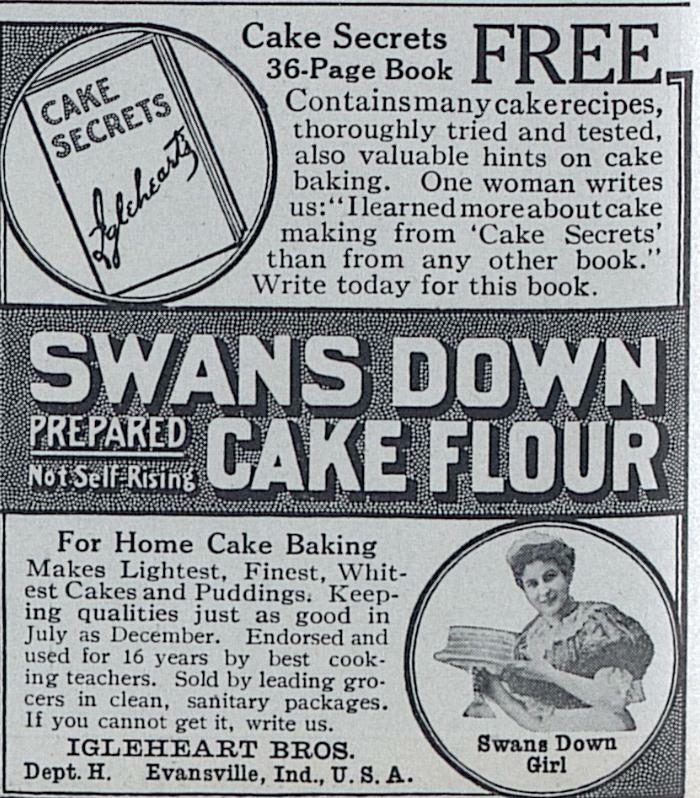 You might come across a box of Swan Down Cake Flour somewhere. They still sell it at a store when I often shop. Thank you for the kind words about this blog. I’ve really enjoyed doing it. In some ways I feel sad that Grandma is less interested in writing in the diary than she once was; in other ways I feel fortunate that she kept the diary for four years during her teens and that it provided a wonderful window into what she was like as a young woman. Wouldn’t mind some of that! I am rather slack and don’t use cake flour but it does make a difference. I buy all purpose most of the time. I think one can make all purpose better for cakes by adding cornflour; can’t remember. Thanks for letting me know. It’s wonderful to know that you’ve enjoyed that recipe so much.